Mango White Cake celebrates Lemon in Ginger turning 5 years, celebrates our 10th wedding anniversary and also an advance celebration of dear friend, Gomati’s birthday which is actually on 2nd but we wanted to celebrate before we all went to our home towns for summer break. And for so many celebrations, a very fitting cake was created. I finally have a perfect spongy, white cake for the base of frosted cakes. I have been making this moist and decadent chocolate cake as a base for most of my assembled cakes but wanted a basic white cake recipe as well. While searching for a recipe, I came across this coffee cake recipe by Madhuram. Since blueberries are not commonly available in India, I was wondering which flavour I shall choose for it, and then I read in notes section that Madhuram recommends this as a great white cake base. The ingredients were familiar and easily available so making this cake as a test was no brainer and when the first layer baked and de-moulded perfectly, I did a happy jig. I used basic sugar syrup and ready-to-whip cream. Assemble and decorate as per your choice. I chose fresh mangoes and why not! This is the mango season to celebrate. The cake soaks syrup very well and is soft and moist. Priya helped me bake this cake and I gave her the responsibility of making the lace collar. I don’t consider myself good with piping bag so she did the honours. We just melted some chocolate and piped random design on parchment paper which was wrapped around the cake after the chocolate was slightly dry. Once the chocolate hardens, remove the paper and the collar will stick. You can place the cake in refrigerator for 5 minutes for hastening the collar setting. The cake was devoured in few minutes and the party was a huge success. 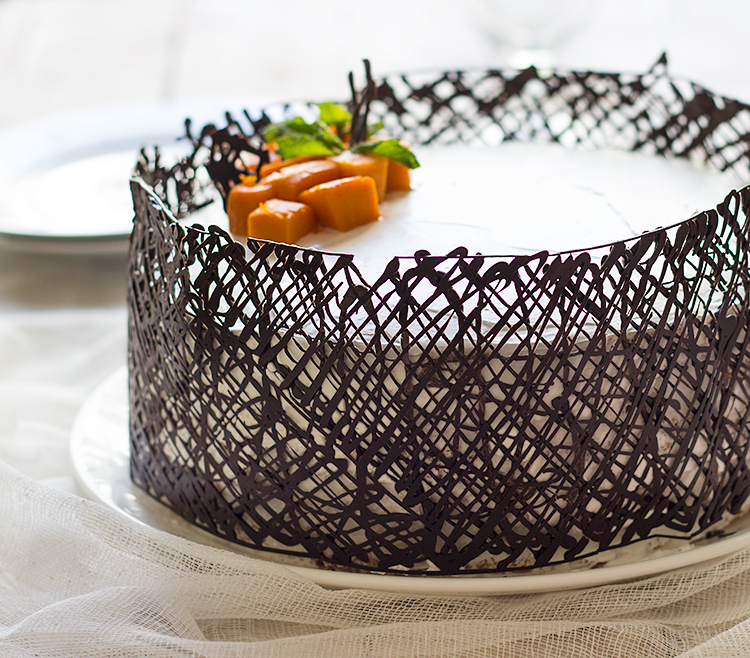 A delicious cake filled with mangoes. It is super soft and moist. A melt in your mouth experience. Loosely adapted from this recipe. I used curd in place of buttermilk and adjusted the consistency by another 1 teaspoon of curd. Melt some chocolate and pipe a random design on parchment paper. Wrap the paper around the cake after the chocolate is slightly dry. Once the chocolate hardens, remove the paper and the collar will stick. You can place the cake in refrigerator for 5 minutes for hastening the collar setting.